Joyful movement can raise a game’s quality to lofty heights. That’s why it’s so impressive for Marvel’s Spider-Man to swing in and make the core act of traversal a constant wonder. The game is one of 2018’s biggest hits because it layers satisfying combat and a sincere story onto the foundation built by Insomniac’s jubilant web-swinging. Swinging from webs in Marvel’s Spider-Man is intuitive and freeing. Simply holding the R2-button turns every movement into a ballet of blue and red. If you can imagine a complex, death-defying route between skyscrapers or across rooftops, you can execute it with finesse. This experience would be entertaining even if Spider-Man were swinging through an empty city, but Marvel’s New York is brimming with colorful characters, engaging activities, and enough hidden collectibles to make Comic-Con’s merch section envious. The city that never sleeps, indeed. The story the writing team has spun is compelling and authentic. The game stars a full-grown Peter Parker, whose daily battles range from the Super (Kingpin, Rhino, Electro and the rest of the Sinister Gallery) to the human (having a job, paying rent, and maintaining healthy relationships). Parker’s human flaws – including his complicated relationship with Mary Jane – make him a relatable and likeable hero. The overall narrative’s twists and turns are enough to keep even the most casual Spider-Man fans coming back for more. Dealing justice as the heroic web slinger is a triumph in combat design. Players battle crowds of thugs, juggling deadly targets like musclebound bruisers and punks armed with rocket launchers. It’s a gleeful experience zipping between enemies, webbing them to walls, and flinging objects like manhole lids and mailboxes. A suite of gadgets and skill upgrades evolve the crime-fighting experience, offering advantages like sticky Web Bombs and the ability to disarm crooks from afar. 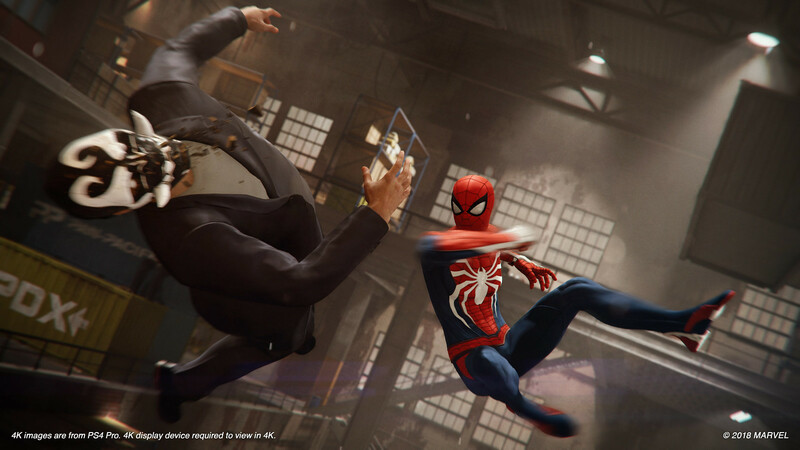 Stealth sequences are also liberating, with Spidey’s mobility enabling him to dart through the shadows and satisfyingly web enemies to nearby surfaces. Marvel’s New York is the ideal playground for fighting crime and free-wheeling exploration. The amount of collectibles, side missions, and emergent vigilante opportunities is plentiful without being overwhelming. You truly feel like a Super Hero when you’re swinging along the tops of skyscrapers, receive a police radio call, then swoop down to stop a gang of goons from stealing a car or committing a robbery. Challenge missions like hunting down Black Cat’s calling cards and tackling Taskmaster’s trials also flesh out Spidey’s original universe. Even smaller collection-based objectives, like finding Peter Parker’s many stashed backpacks, provide novel nods to the prolific character’s legacy. Who doesn’t want to discover a fan-made Spider-Man plushie? The many strengths of Marvel’s Spider-Man coalesce into one of the best Super Hero games ever. Even better, the adventure continues with worthwhile DLC story chapters that feature the likes of Black Cat, Hammerhead, and more. Whether you’re a devout comic book reader, lover of Marvel’s cinematic blockbusters, or just a fan of amazing video games, don’t miss one of 2018’s masterpieces.